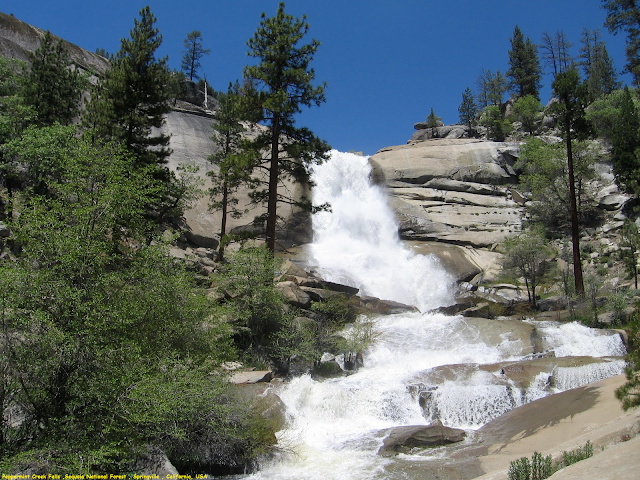 Peppermint Creek Falls is a very pretty 150ft waterfall tumbling over a rounded granite surface with views towards the Dome Land Wilderness. Since getting to the falls involves driving the Lloyds Meadow Road , you'll get to glimpse the Needles - an unusual formation that is also known as a difficult rock climbing route. Getting a good view of the falls required a rather steep scramble towards the base of the falls. Even though the scramble was only 1/4-mile (each way), we definitely had to take our time since the terrain was both slick and the incline was severe enough that going down was a little scary and going up required the use of our hands in some spots.